Much of the education system in Colonial America was based on ideas brought over from England. Back in Britain, children were educated at home by family members who had the abilities one needed to know. Mothers often taught children to read and sew, fathers typically taught arithmetic, with various members from the church and community filling in blanks as needed. Schools really didn’t offer the kind of established education they do today. The challenge is that if parents were not literate, and could not find someone to teach a child, children would be drastically underprepared for the world ahead. In New England, schools began to spring up in the middle of the 1600s. The Boston Latin School was founded in 1635, and remains the oldest school in America to this day. 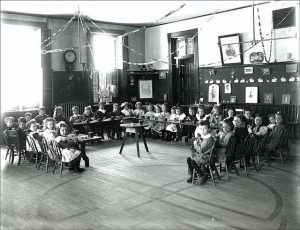 Literacy tended to be higher in the Northern part of the country like New England, and schools were very much viewed as a space for youths to socialize. In 1642, Massachusetts developed an educational compulsory that the rest of the colonies soon adopted. It involved all-male facilities, one teacher in control of the room, and established a tuition system to pay for everything. Within 200 years, the school would become the center of learning. Larger towns in New England began opening schools that taught literacy and languages. Public schools supported by tax revenues began to spring up in larger numbers, and it was more common for women to seek education. Elite private schools, then known as “prep schools”, from that era eventually formed the backbone of the Ivy League system in America.